They say its what’s on the inside that counts. They also say purple is the color of royalty, so either way 843 East Kensington Road is a win. 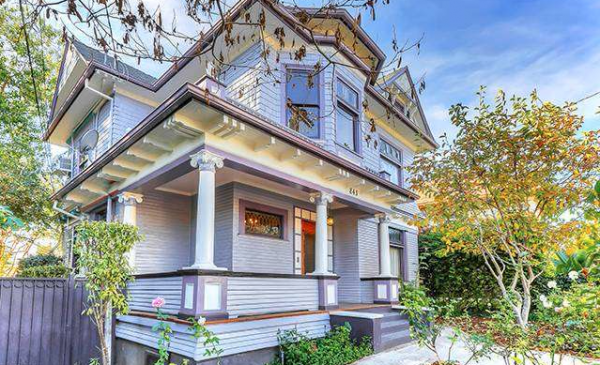 Built in 1901, this ornately colored Victorian surprisingly fits the color schemes of the era. Whether that sits well with you over a century later is purely subjective, but take a look inside first before dismissing it altogether. It may surprise you. 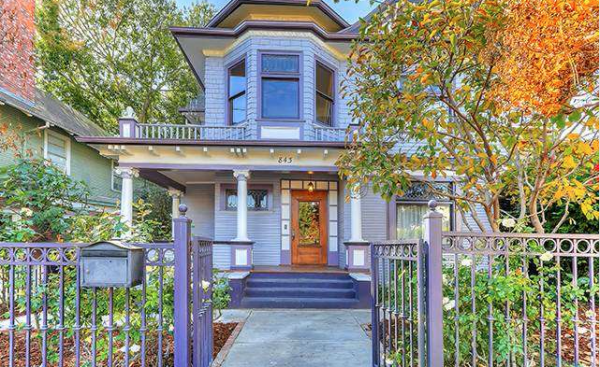 Also known as “painted ladies,” with a home such as this plum example, the neighbors must give it their stamp of approval, since all color schemes must be approved through the Angelino Heights HPOZ Board. 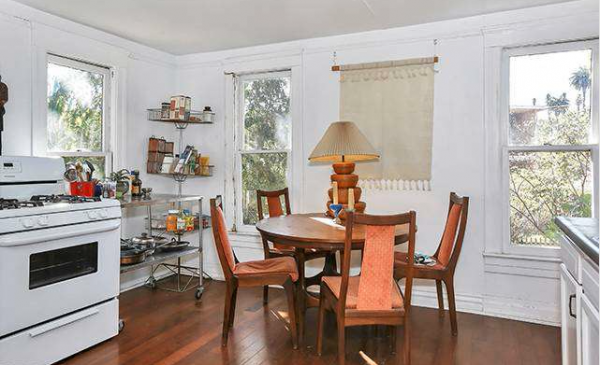 Additionally, your $985,000 also nets you an adorable detached (and legally zoned) 1 bedroom + studio rental unit with its own charming characteristics, but I am jumping ahead. Located just off Sunset Blvd. 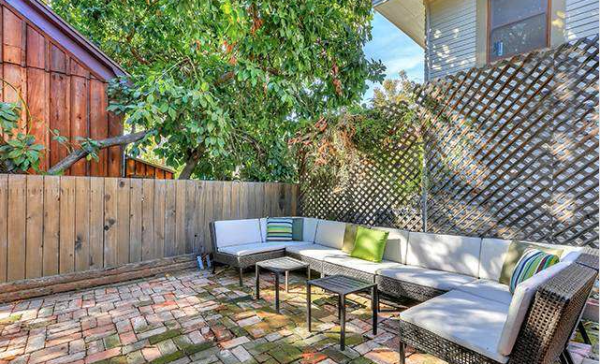 in Angeleno Heights on a healthy 8,900 sq/ft lot, 843 East Kensington boasts 4 bedrooms and 3.5 bathrooms within its 2,700 sq/ft walls. 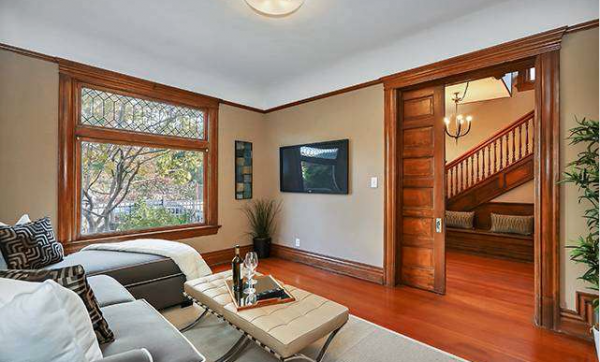 The woodwork and original detail have been tastefully restored with proper pocket doors and built-ins throughout. Those themes continue on to the dining room. Though color is always a personal matter, the choices throughout the interior of the home only add to the classic craftsmanship. 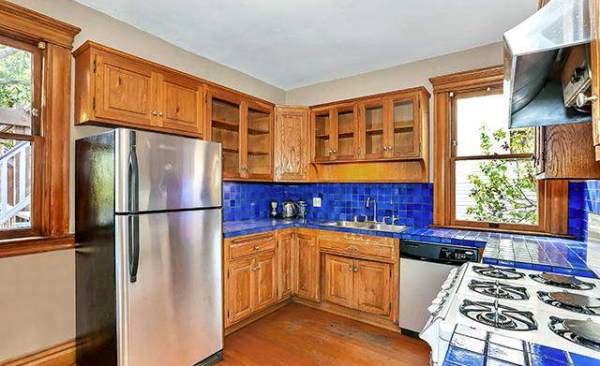 The kitchen is certainly — vibrant. The mix of stainless steel fridge and dishwasher with an antique style oven seem to clash. Thankfully that can easily be remedied. 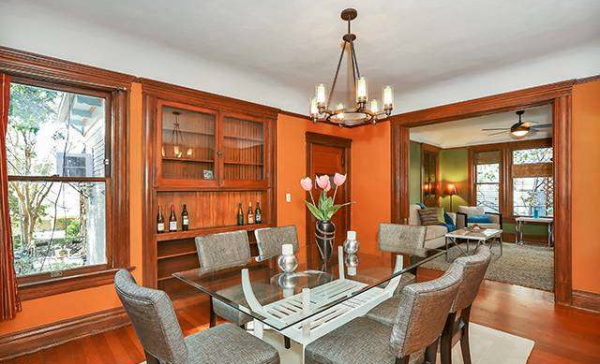 Since we’re kind of covering two homes on one lot, I am going to skip the bed and bathrooms, but will say the old-fashioned charm continues throughout, and won’t disappoint. The second structure is a separate beast — with the look of a converted farmhouse with its purple door and vertical-grain wood board. 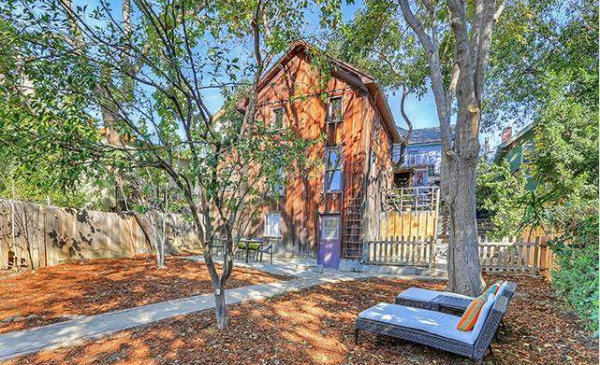 The home is certainly smaller in square footage, but offers a separate yard and a style all its own. 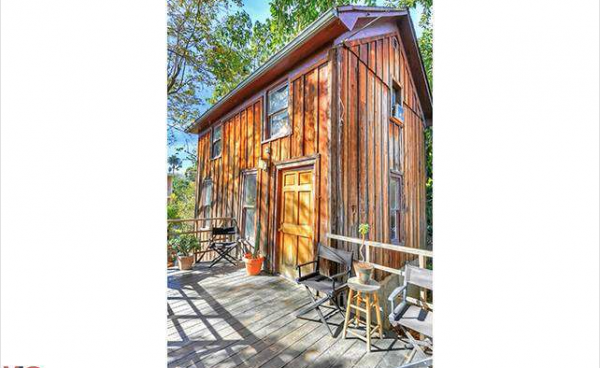 It would make a perfect rental, in-law unit, or writer’s studio. 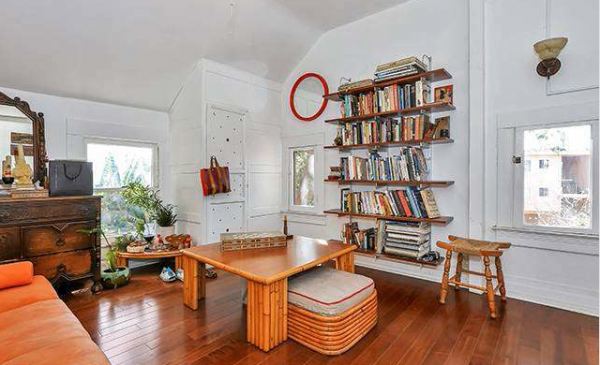 The moderately pitched roof from the outside makes for a cozy living room inside. The kitchen, while small, has plenty of windows to give it a pop of light. 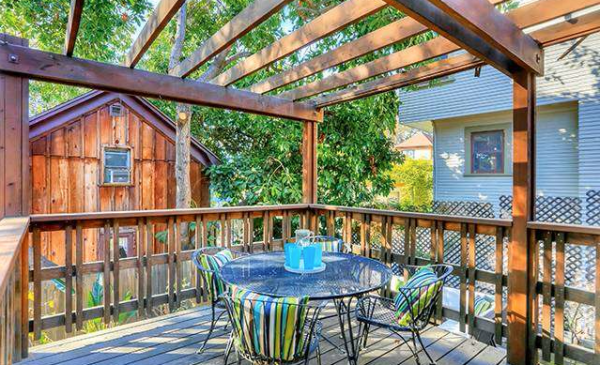 For dining al fresco, there are 2 separate spaces for you to choose from. 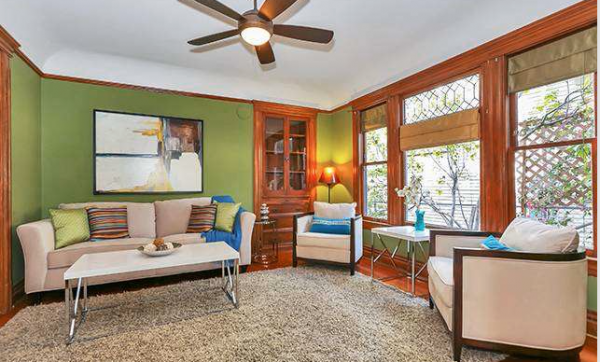 I especially adore the large rattan lounge above the red brick floor — perfect for entertaining. For a private showing, feel free to contact Jovelle Schaffer at (213) 718-1110. Judy Oroshnik and Dean Decent of Berkshire Hathaway HomeServices represent the Seller.